As many Outlook users will tell you, categories play an important role in keeping everything organized. 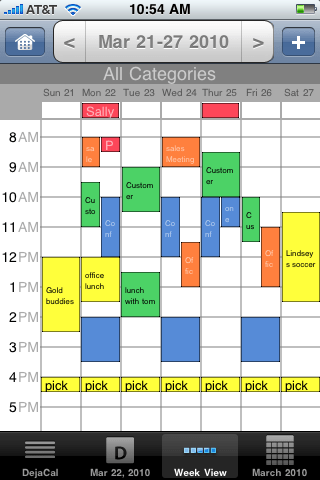 Categorizing your contacts, calendars, notes, & tasks helps you to break them down into manageable groups of information. Color-coding this information further helps by giving you the ability to interpret data at a glance. For example, I use yellow to signify a business call. I use red to denote a mission critical appointment. I use blue for business meetings, and green for personal meetings. Just by glancing at the color of an appointment, I know what it’s for. Business people rely on similar systems every day to be productive. However, another thing many Outlook users will tell you is that they have not found a great way to sync categories to the iPhone, iPod Touch, iPad, & Android devices. This is a major concern for many people. The ability to categorize data efficiently becomes severely limited when it is only accessible at the computer. We are a mobile society, and we need our information available at a glance if we are to stay productive on the go. Therefore, the ability to sync Outlook categories is not just convenient for most users, it’s quite important! That’s where DejaOffice enters the picture. 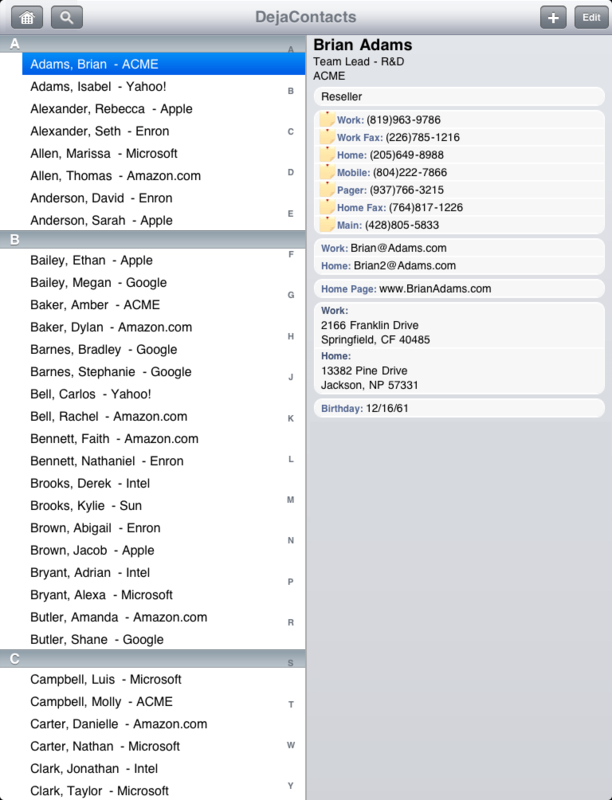 DejaOffice is a free iOS and Android app that we built in response to the need for a great way to sync data from Outlook, as well as a variety of other popular Personal Information Manager programs. Using DejaOffice in conjunction with CompanionLink for Outlook allows you to sync your existing category data from Outlook to your Apple or Android device over Wi-Fi or via CompanionLink Secure Hosted Wireless. With DejaOffice and CompanionLink, you are able to take your categories with you! For more information on how to set up and sync Outlook categories, visit our support page. Today is the day that many Verizon customers have been waiting for. The Apple iPhone officially went on sale for pre-order on the Verizon network at 3am EST today. While the iPhone has been available for a few years, today marks the first day that US customers have a service option other than AT&T. As a happy iPhone user myself, I’d like to extend a warm welcome to the many Verizon customers who will soon be getting their first iPhone. One of the first things you’ll likely be doing is heading in to the App Store to start downloading apps. As you’ll soon discover, there are many great apps to install. I personally recommend downloading Dropbox, Dragon Dictation, and Kik Messenger, to name a few. That said, I’d like to focus on one app specifically: our very own DejaOffice. 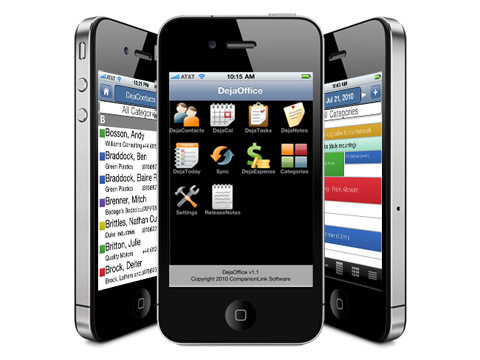 DejaOffice is designed to enhance the iPhone experience for business customers. 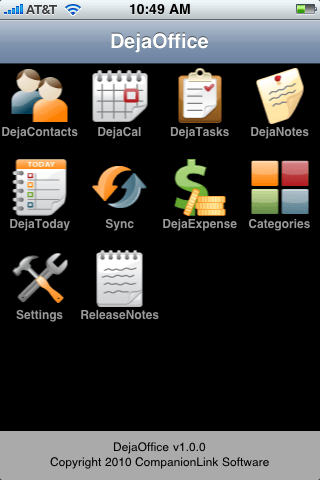 With DejaOffice, you gain access to business-class contact, calendar, note, and task management. A detailed list of features is available at www.dejaoffice.com. These features make all the difference for business people who are looking to stay productive while on the go. DejaOffice works great as a stand-alone app. However, many business people have spent time carefully nurturing customer databases they’ve built up over the years. They need a way to get their customer info on their new iPhone. That’s why we built DejaOffice! It works seamlessly with CompanionLink. When paired with the CompanionLink application for PC, DejaOffice will sync data with many of the most popular database systems available, including Microsoft Outlook, ACT!, Palm Desktop, Lotus Notes, and more. DejaOffice [iTunes link] is currently a free app on the iTunes App Store. CompanionLink is a PC application available as a 14-day trial: https://www.companionlink.com/products/. 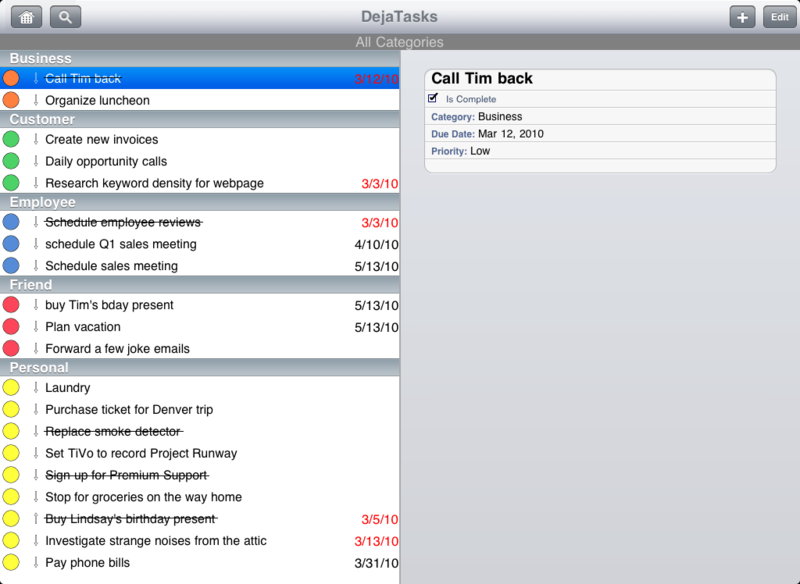 DejaOffice, a mobile office application suite, is now available for iPad and iPhone in the Apple App Store. 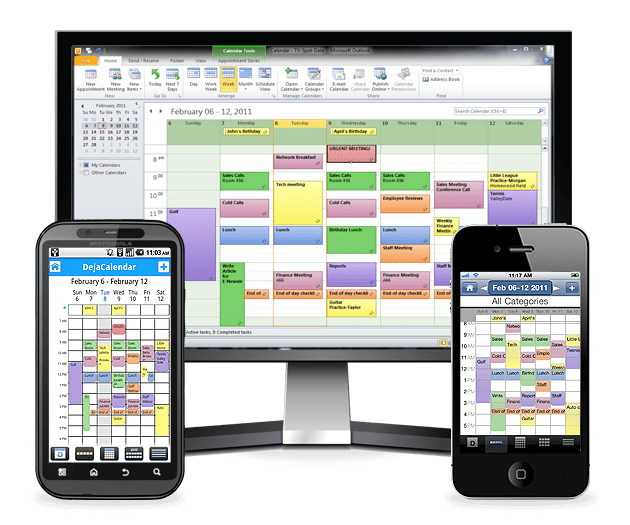 Designed for professionals who need quick access to manage their schedule, DejaOffice offers business-friendly contacts, calendar, tasks and notes for iPad and iPhone. 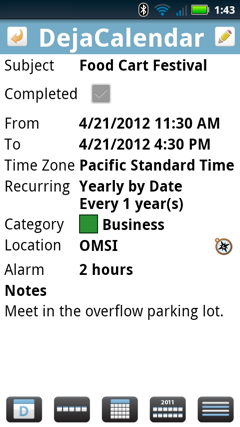 DejaOffice lets iPad and iPhone users efficiently view, enter, update and manage contact and schedule information. The app supports advanced business features such as categories, custom fields, advanced search and sort options, expense tracking, and linking of contacts to calendar. DejaOffice also takes advantage of the iPad’s large screen to offer additional display modes like dual-pane viewing. The iPad is a leap forward in mobile office productivity. Business professionals can pull up DejaOffice and easily take a few moments to organize their week’s schedule, plan business tasks, jot down expenses and make contact notes. DejaOffice is compatible with CompanionLink’s PC software that provides two-way synchronization with applications such as Microsoft Outlook, IBM Lotus Notes, Novell GroupWise, Microsoft Outlook Business Contact Manager, ACT! by Sage and Palm Desktop. 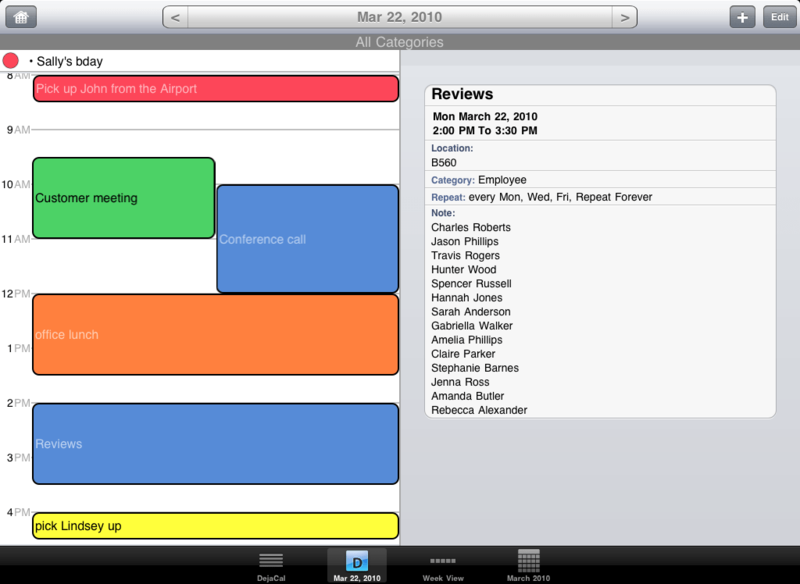 DejaOffice for iPad and iPhone is currently available for free from the App Store. More information is available at www.dejaoffice.com.